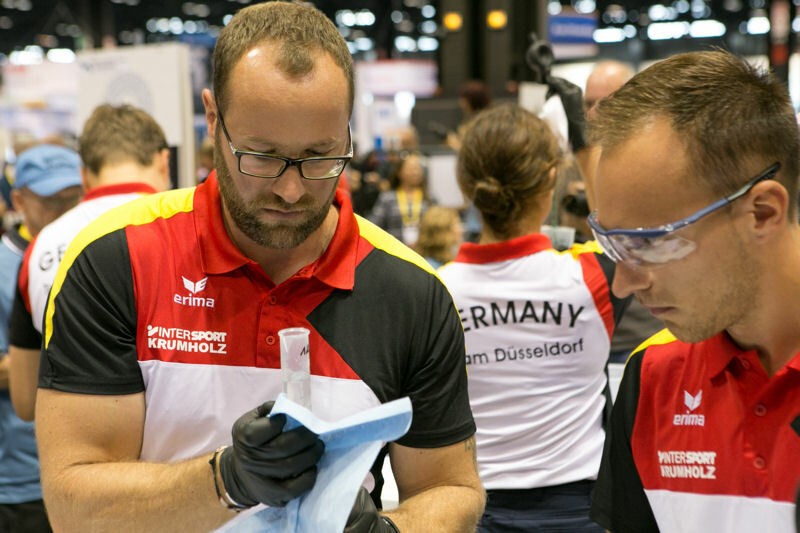 Two Operations Challenge teams from Germany competed WEFTEC 2015. Members of DWA Team Düsseldorf work together during the Laboratory event. Photo courtesy of Kieffer Photography. 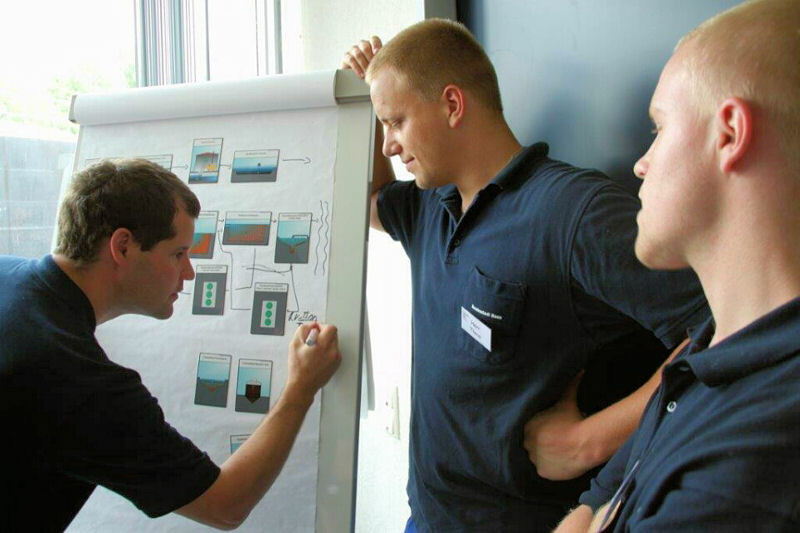 In 2012, the Association for Water, Wastewater, and Waste (DWA; Hennef, Germany) hosted its first Operations Challenge competition during the international water sector conference, IFAT. At the last competition in 2014, 32 teams from Germany, Austria, Romania, Hungary, and Egypt competed. The United States is expected to join other international teams at the next competition in Munich next year. Wastewater professionals work on the German Operations Challenge Process Event by using magnets to make a flow chart of the treatment process. Photo courtesy of Rüdiger Heidebrecht. Rüdiger Heidebrecht, coach for Germany’s WEFTEC 2015 teams — DWA Team Düsseldorfand and DWA/IFAT All Star Team — and head of education and international cooperation at DWA, and Johannes Lohaus, DWA CEO, developed the German Operations Challenge competition to motivate and train water-sector operators. Heidebrecht is looking forward to welcoming a U.S. team to compete in the 2016 German competition, which will be held during IFAT, May 30 to June 3. 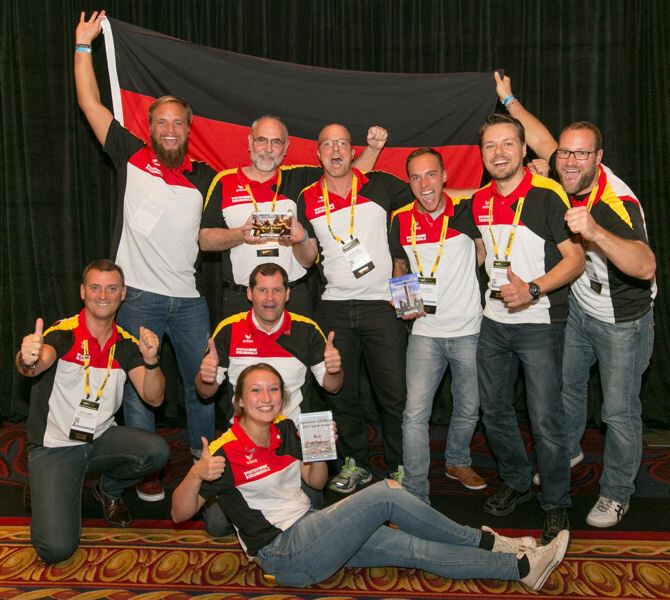 The two German teams celebrate receiving Operations Challenge spirit awards. Team Düsseldorf won the awards for Team Congeniality and Best Fan Support and the All Star Team won the spirit award for Team with Best Effort. Photo courtesy of Oscar & Associates. In Germany, teams are given more time to complete each event. “It’s more important that you do it correct then you do it fast,” Heidebrecht said. The competition has helped motivate water sector employees in Germany as well as other countries. The office for the water resource recovery facility in Düsseldorf displays a photo of their Operations Challenge team and the trophy the team won during the 2014 competition. 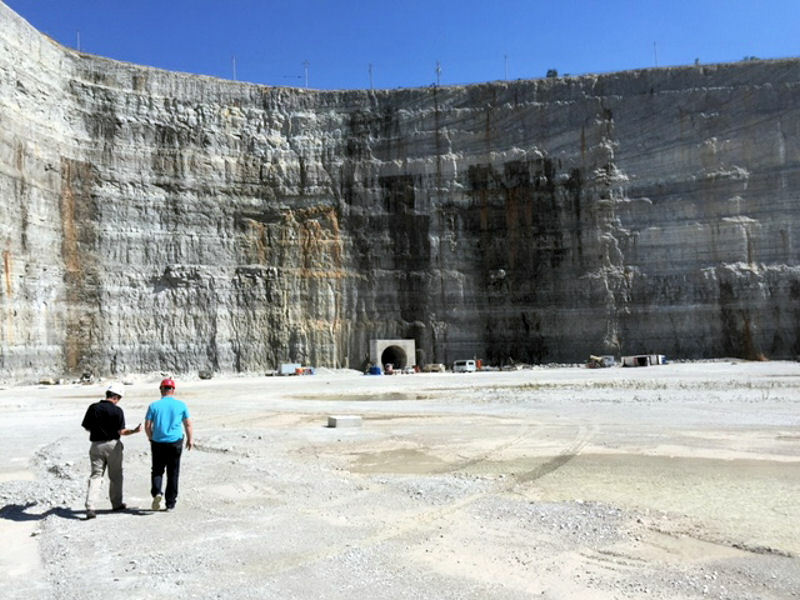 Seeing the teams and competition has helped excite staff about regular safety training, Heidebrecht said. Metropolitan Water Reclamation District of Greater Chicago (MWRD) Thornton Reservoir. Photo courtesy of Heidebrecht. The process test has become a tool DWA uses to train operators in other countries as well. For the test, teams use a kit with magnets depicting the wastewater treatment system to make a flow chart of the treatment process and perform calculations. Now the kit has been translated into other languages for training in different countries. “We have it in Russian, we have it in Hindi, in Vietnamese … in Farsi, in Dutch, in Polish — Spanish is on the way,” Heidebrecht said. Past competitors Donnie Cagle (left) and Stephen Motley (right) pose with DWA Team Düsseldorf members Ulli Horst Winkler, Maren Scholten, Hans-Joachim Ziethen, and Tobias Hasselhoff during a special practice session hosted by the Illinois Water Environment Association team, the Sewer Rats. Photo courtesy of Heidebrecht. 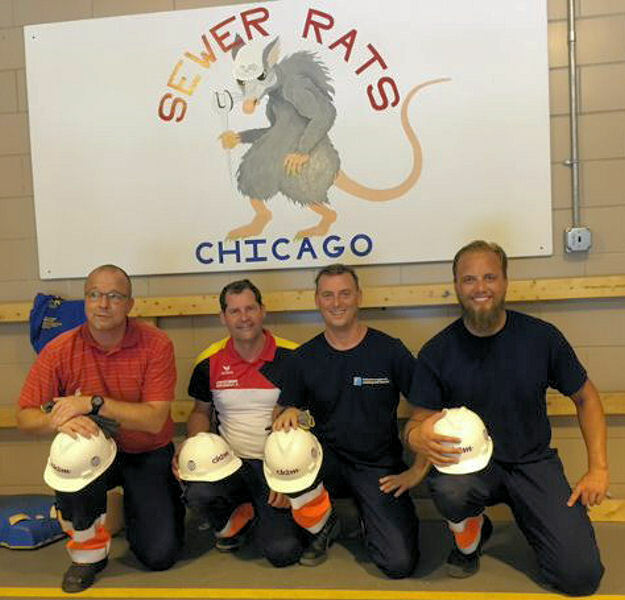 DWA/IFAT All Star team members Peter Albrecht, Achim Höcherl, Michael Dörr, and Sven Theus participated in a training session hosted by the Sewer Rats before the 2015 Operations Challenge competition. Photo courtesy of Heidebrecht. 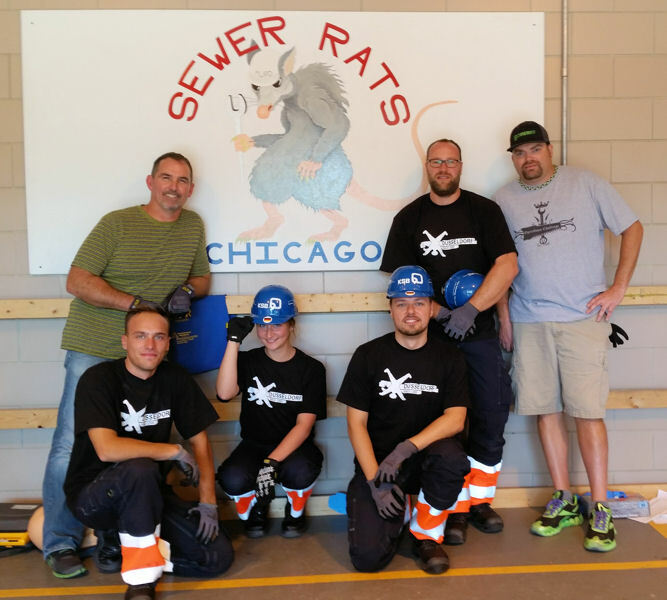 The process test kit has made its way to the U.S. Ed Staudacher, coach of the WEFTEC 2015 Operations Challenge team, the Sewer Rats from Illinois Water Environment Association,said he will start using the kit. During WEFTEC® 2015, 44 teams gathered to compete in the 28th annual Water Environment Federation (Alexandria, Va.) Operations Challenge competition. This was the largest number of teams ever assembled at the competition. And two teams emerged on top — the TRA CReWSers placed first in Division 1, and Motley Poo placed first in Division 2.